Keno is an ancient Chinese lottery-type game. It’s playful ease has earned it wide popularity worldwide. 1. 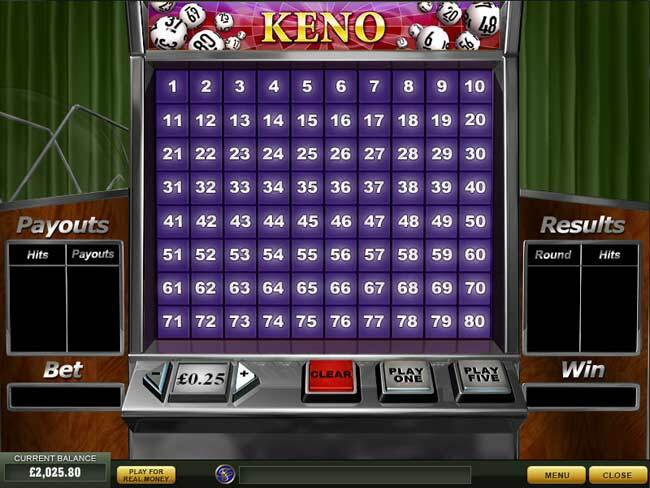 First, select at least 2 and up to 10 numbers on the Keno table by clicking on them. If you changed your mind and want to deselect a number, just click on it again. To deselect all the numbers and start again, click on the Clear button. 2. While you select the numbers, you can see the Payouts Table on the left. The payouts (winnings) depend on how many numbers you select. The table shows how much money you win (the Payouts column) for any amount of correct numbers (the Hits column). 3. Now select the amount you want to bet on one game round by clicking the + and – buttons. Then press Play One (play for one round only) or Play Five (play a five-round series). 4. When you press one of the Play buttons, 20 numbers are drawn. If you have a sufficient amount of hits (winning numbers) you are paid winnings according to the winnings table. If you are playing the five-round series, you can see your last results in the results table on the right. Use the random pick feature to let the computer pick random numbers for you. Select how many numbers you want to play with and whether you want new numbers to be selected before each game round (if you select this option, the button on the Keno machine says Random Pick: ON). Now click the Pick button. Click Exit to exit the dialog without picking new numbers.